Two years after our first batch of Pluto shorts, Disney finishes off the pooch’s run as a headlining star. The Complete Pluto, Volume Two presents 20 cartoons, and these span a period of four years. We start with 1947’s “Mail Dog” and progress through 1951’s “Cold Storage”. Mail Dog (1947, Jack Hannah): Stuck in a snowy clime, Pluto must deliver the mail. A variety of obstacles – most from a bunny who desires warmth – impede his progress. The rabbit seems like an odd instrument of interference, and I can’t quite figure out why he’s so cold but Pluto’s not. Whatever the case may be, the short offers some good gags and succeeds most of the time. 7/10. Pluto’s Blue Note (1947, Charles Nichols): Pluto tries to sing along with the tunes generated by some birds, bees, crickets and a radio, but no one appreciates his harmonizing. Pluto takes on a bit more of an anthropomorphized role than usual here, and it works. His antics as he tries to make music generate cleverness and laughs. 8/10. Rescue Dog (1947, C. Nichols): Pluto spars with a frisky seal. This one echoes many other Pluto flicks. I can’t say it stands out as particularly special, but it manages to become cute and charming. 7/10. Bone Bandit (1948, C. Nichols): Pluto attempts to dig up bones he buried around his yard, but he must battle a persistent gopher to retrieve them. Pluto seems to face an endless supply of cute animals who oppose him, and this short offers another one. The cartoon makes the fight a little nastier than usual, though, and presents a fun take on a typical theme. 7/10. Pluto’s Fledgling (1948, C. Nichols): Pluto takes responsibility for a little bird who leaves his nest too soon. As one might guess, “Fledgling” pours on more of the cuteness, and it doesn’t manage to offer much more than that. The bird looks feisty but stays adorable and dull. 4/10. Pluto’s Purchase (1948, C. Nichols): Mickey sends Pluto to the butcher to buy a sausage, but a bulldog attempts to steal the meat from our pooch. Usually Pluto comes across as the aggressor in his shorts, so it’s nice to see him act as the aggrieved party for once. The maneuverings to obtain the sausage provide good humor. 8/10. Bubble Bee (1949, C. Nichols): Pluto’s attempts to retrieve gum from a machine result in a battle with a bee. Yes, Pluto fights against another cutesy victim, but at least “Bee” manages to expand its horizons somewhat with the gum-related gags. It entertains to a modest degree. 6/10. Pluto’s Surprise Package (1949, C. Nichols): A baby turtle arrives in the mail and Pluto needs to watch him. For once, Pluto encounters a cute animal he doesn’t really fight. Granted, his attempts to keep the turtle safe create anger in our pooch pal, but he’s not really out to get the shelled critter. The plot makes almost no sense, but the turtle really is cute, and the slight change of pace helps. 7/10. Pluto’s Sweater (1949, C. Nichols): Minnie forces Pluto to wear an ugly sweater she knitted, much to Figaro’s delight. The short takes a simple premise and creates good amusement with it. I like Pluto’s vision of Minnie in the sweater, and the way Pluto displays his horror when forced to don it in public offers many good laughs. This turns into a solid cartoon. 8/10. Pueblo Pluto: (1949, C. Nichols): On a trip through the southwest, Pluto battles a local pooch who tries to steal his bone. Really, this short doesn’t have a lot of reason to take place in the southwest. It offers a few gags related to cacti and other local phenomena, but mostly it’s just a cute clip where he meets a new dog. 5/10. Sheep Dog (1949, C. Nichols): Two coyotes attempt to get past Pluto and eat his wooly charges. Unlike the other shorts on this disc, Pluto plays a relatively minor role here. The coyotes dominate the cartoon and create most of its humor. We get some decent sight gags but nothing especially memorable. 6/10. Camp Dog (1950, C. Nichols): The coyotes from “Sheep Dog” return and try to steal vittles from a spot guarded by Pluto. Once again, Pluto plays a supporting role in his own short. “Camp” acts as a variant on “Sheep” with most of the same strengths and weaknesses. 6/10. Food for Feudin’ (1950, C. Nichols): Pluto provokes the wrath of Chip ‘n Dale when he interferes with their supply of nuts. “Food” works to the strengths of the chipmunks and creates a pretty good adventure. 7/10. Pests of the West (1950, C. Nichols): Here come the coyotes again! This time they attempt to steal chickens guarded by Pluto. I suppose I shouldn’t slam these coyote shorts just because they all feature the same plot; after all, each and every Road Runner cartoon boasted identical stories. Still, the fact that the folks at Disney couldn’t muster cartoons in which Pluto does more than react in a supporting way makes them flawed. I could accept a couple of these, but we’ve clearly encountered a trend. 5/10. Pluto and the Gopher (1950, C. Nichols): A pesky varmint messes up Minnie’s garden and drives Pluto nuts. Many Pluto-centered shorts follow this kind of plot. They show his battles with other creatures and his troubles with his rodent masters. “Gopher” acts as a decent representative of those pieces. The critter in question displays decent personality and helps allow the cartoon to work despite its predictable nature. 6/10. Pluto’s Heart Throb (1950, C. Nichols): Pluto falls for a female dachshund but has to fight Butch the bulldog for her affections. The results are predictable and only moderately amusing. 5/10. Primitive Pluto (1950, C. Nichols): Pluto’s “primitive instinct” alter ego emerges during a visit to a cabin and forces him to go back to basics. A definite departure for the character, this one feels more like Donald Duck short in many ways, and that’s a good thing. It brings out some interesting moments. 7/10. Puss-Café (1950, C. Nichols): Two cats named Milton and Richard try to infiltrate Pluto’s yard to steal some grub, and he attempts to stop them. I don’t know if Disney wanted Milton and Richard to become new stars, but it didn’t happen; only one of them even showed up in another cartoon. This one’s decent, but the two cats weren’t very engaging, so since the short focused on them, it fell a little flat. 5/10. Wonder Dog (1950, C. Nichols): Pluto pines for the dachshund we met in “Throb” but she only has eyes for circus performer Prince. He practices performance routines but gets chased by Butch again, an issue that inadvertently impresses his object of lust. “Dog” gives us a clever twist on a typical them and integrates the circus elements well. 8/10. Cold Storage (1951, J. Kinney): In freezing weather, a large bird tries to get warm in Pluto’s doghouse. Typical antics ensue as Pluto attempts to retain his territory. The odd-looking bird creates a little more amusement than usual; at least he’s not a typical cutesy critter. 7/10. DVD Two includes four additional shorts that it places in a section called From the Vault. It appears Disney put these four cartoons in a separate area due to controversial elements. Leonard Maltin introduces this domain with a 59-second clip that puts them in historical perspective. One annoyance: the DVD makes it impossible to skip this introduction. You can’t chapter search past it, though unlike prior Maltin “Vault” intros, at least you can fast forward through it. Figaro & Cleo (1943, Jack Kinney): Figaro the cat resists his urge to eat Cleo the fish. More musical in nature than most, “Cleo” seems interesting at times, but it’s too heavy on cute and too light on content. 5/10. It ends up in the “Vault” due to a stereotypical “black mammy” character. Cat Nap Pluto (1948, C. Nichols): When Pluto tries to nap, Figaro the cat wants to play and won’t allow the pooch to snooze. This seems like an awfully thin premise for a short and it doesn’t ever go anywhere. It turns into an ordinary clip at best. 5/10. It finds itself in the “Vault” because of a “Japanese sandman” allusion and the depiction of Chinese coolie hats. Cold Turkey (1951, C. Nichols): Pluto and his feline friend crave a turkey advertised on TV. A little broader than the usual Disney fare, “Turkey” features some clever routines and good slapstick. 8/10. Potentially cruel and excessive violent puts “Turkey” in the “Vault”. Plutopia (1951. C. Nichols): Mickey and Pluto go camping but they learn dogs aren’t allowed in the cabins. While stuck outside for the night, the pooch dreams of a land in which he gets all his wishes. This one takes a fairly clever path and offers some quirky humor. 7/10. Violence again locks a toon in the “Vault”. 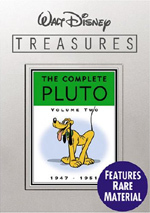 The Complete Pluto, Volume Two appears in an aspect ratio of 1.33:1 on these single-sided, double-layered DVDs; due to those dimensions, the image has not been enhanced for 16X9 televisions. Although the transfers here didn’t match up with those from the first volume of Pluto shorts, at least they bettered the exceedingly inconsistent visuals from the various 2005 “Walt Disney Treasures” releases. Source defects created the most noticeable concerns. A mix of specks and marks popped up throughout the shorts. These never became heavy and certainly weren’t as bad as what I saw with those 2005 sets, but they created more minor distractions than I’d like. The shorts did turn rather grainy at times, though. Sharpness usually seemed solid. Some edge enhancement occasionally rendered the shorts a bit ill-defined, but those examples remained modest. Most of the cartoons appeared concise and distinctive. Jagged edges and moiré effects essentially stayed absent. Colors worked well for the most part. Occasionally they faltered and could seem a little messy or runny. For instance, a purple background infected Mickey’s face during a shot in “Pluto’s Purchase”. Most of the hues seemed lively and dynamic though. Blacks followed suit with dark, tight tones, and shadows appeared appropriately visible. A few shorts like “Pluto’s Surprise Package” came across as a little too bright, and I also found the coyote cartoons to be a smidgen too dark, but those examples were exceptions. Overall, these transfers suffered from some problems but remained more than watchable. I thought the monaural audio of Complete Pluto was similarly acceptable. Quality remained surprisingly consistent. Source noise wasn’t much of a distraction. Hiss occasionally interfered, but I usually didn’t notice any concerns of that sort. Speech was exceedingly minimal. Very few lines of dialogue appeared, though we got a lot of barks and other animal sounds. Vocalizations were appropriately crisp. Effects lacked much heft and showed restricted tones, but they seemed perfectly acceptable given their vintage. The same went for the lackluster but clear music. Though I’d have liked more presence from the scores, they showed decent heft for tracks recorded almost 60 years ago. The audio of Pluto was fine given its constraints. 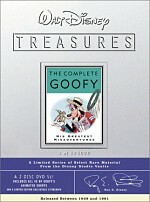 As with all the “Walt Disney Treasures” releases, The Complete Pluto Volume Two features a smattering of supplements. On DVD One, we start with an introduction from Leonard Maltin. In this two-minute and 20-second piece, the film historian discusses the challenges animators face with Pluto. Under the banner of Master Class, two elements appear. Animator Randy Cartwright Discusses “Bone Trouble” runs 14 minutes, 43 seconds. Essentially Cartwright offers commentary for the short; he chats about the various techniques used as we watch it. Occasional pauses, slow-motion shots and repeated passages are why the piece runs much longer than the cartoon’s standard running time. Those help point out particularly interesting poses. Along with some notes about Pluto-related challenges, these allow the discussion to become fun and informative. In a similar vein, Animator Andreas Deja Discusses “Hawaiian Holiday” goes for nine minutes, seven seconds. This piece uses the same format as the Cartwright featurette, though we don’t get as much of the still frames, slo-mo or other methods to more closely examine the material. Deja discusses the short’s influence on 2002’s Lilo & Stitch as well as various aspects of the techniques used for “Holiday”. It’s another winning program though not quite as insightful as Cartwright’s chat. Pluto’s Process examines animation issues. A Deconstruction of “Pluto’s Judgement Day” and “Pluto’s Judgement Day” Pencil Test both take up eight minutes, 15 seconds. The former mixes final cartoon, pencil tests, and storyboards to show the methods used to create the short. The latter simply sticks with the raw animation. Both are great to see as they illustrate the different elements. As we move to DVD Two, we start with another introduction from Maltin. This one lasts two minutes, 42 seconds, as he discusses the character’s evolution, the filmmakers who handled him, and what to expect from this disc. Maltin offers a meatier than usual examination as he digs into attributes of various writers and animators. After this we get two Bonus Cartoons. First we find “Bath Day” (1946, C. Nichols): Minnie cleans up Figaro, a fact that leaves the cat open to the mockery of other felines. Figaro never became one of Disney’s stars, probably because he failed to present a lively personality. This short suffers from that factor, as the kitty doesn’t emerge as a winning character. It’s a relentlessly ordinary cartoon that lacks a strong story. 4/10. We also discover “Figaro and Frankie” (1947, C. Nichols): The cat tries to shut up warbling canary Frankie. Here we find another reminder why Figaro failed to attain stardom. This short comes across as little more than a wimpier take on the Sylvester/Tweety wars. It seems toothless and without enough ingenuity to make it enjoyable. 4/10. After this we get threeGalleries. We find “Pluto Backgrounds” (20 screens), “Pluto in Progress” (104) and “Pluto Published” (50). “Backgrounds” shows the plates used for backgrounds in the shorts, while “Progress” features storyboards, concept art and other behind the scenes elements. Finally, “Published” displays magazine covers, ads, comic strips and other such elements. All are great to see. Finally, the DVD’s booklet includes a short text overview from Maltin as well as some archival images. An insert card also displays a reproduction of the poster for “Rescue Dog”. 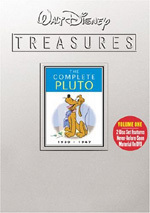 The Complete Pluto, Volume Two gives us a decent set of cartoons that star the mute canine. None of these truly excel, but all are pretty entertaining; virtually no true duds emerge. The DVDs provide reasonably good picture and audio along with a few nice extras. 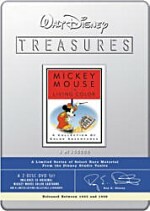 With only a little more than two hours of cartoons – not including “bonus” elements - this isn’t one of the most packed “Walt Disney Treasures” releases, but it remains a must-have for animation fans.